Home Adventure explorer family Island Malaysia snorkeling Travel vacation A slice of paradise on earth! A slice of paradise on earth! I am a beach person. I love the feeling of warm sand under my feet whilst the breeze blows through my hair. Watching the endless expanse of the ocean, hearing the gentle waves hurtling towards the beach while I laze around under the beach umbrella with a cool drink in my hand is my idea of a perfect vacation. It was in pursuit of this ideal vacation experience that I began to search for a perfect destination. Of course, the first thing I did was to Google for the “perfect beach destinations” and I came across Tioman Island, which Google said was one of the most awesome destinations for beach lovers like me! So, after loads of planning - places to visit, planning logistics, booking for stay, etc etc, we finally set off on our journey to what was said to be one of the most beautiful islands in the world! marine park where our ferry dropped a bunch of excited passengers (including us) to look for a white bus that would ferry us to ‘Berjaya Tioman Resort’. Our short trip to Berjaya Resort was through narrow winding roads and we managed to get a glimpse of delicious smelling food being cooked at open kitchens and customers hunching over their steaming plates of tantalizing food. Am sure I caught more than one of my fellow passengers drooling over the grilled fish and curried crab being served at the tables in the restaurant. Finally, we reached the resort in the darkness of the warm summer evening. The first thing that hit me was silence, the sound of the crickets, mellow lights and the soft tones of the congenial staff helping us with our luggage and guiding us to our room. After a quick wash, we headed to the Matahari Restaurant for dinner. The rice and fish preparations were simple and tasty with each dish costing anything between 22 to 35 Ringgits. 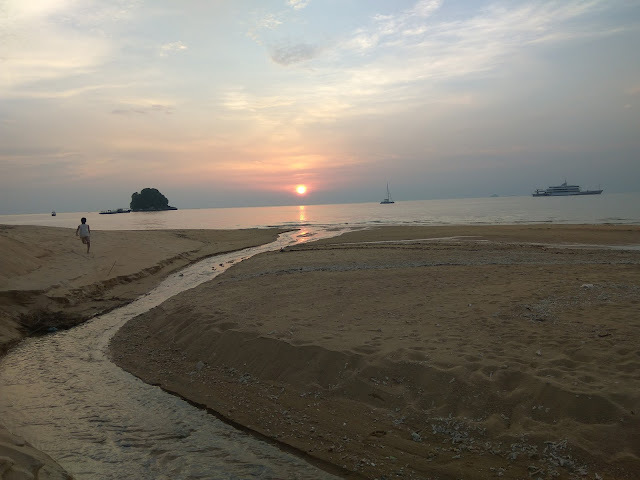 We retired early with the excitement to start a new day at Tioman. At 6 am I could not contain the excitement, I rushed outside and the most incredible feeling set in. The feeling that this place would be everything I read about and more. I was standing between the crystal-clear water of the South China Sea and the towering trees of the rainforest, next to the stack of colourful surf boards on the beach. I wondered if I had walked into a painting! We decided to first explore the island and joined the group that was walking into the forest for a short trek. I had read that the elusive Raffelasia flower, the world’s largest flower that smells like rotten meat can be found at the end of the trail deep into the forest. The was the first question that I asked our guide Salam who the resort assigned to our group. But unfortunately, the flower grew deep in the forest and the trek was close to a day’s walk which hadn’t signed up for. We embarked on our trek. The first thing our guide told us was that on the Tioman Island there is never a fear of being attacked by wild animals since most animals on the island were small game animals which were mostly hunted by the locals during off season. Of course, there were snake, lots of them - large pythons and cobras. So, other than the rare chance of having the misfortune of being bitten by a venomous snake, tourists on this island were rather safe. The strange thing though was that all the shops in Tioman had stuffed tigers kept at their doorsteps. Monkeys were a menace on the island and though the island the monkeys have never seen a tiger they were petrified of these stuffed toys. I guess primal instinct was enough to warn them off the stuffed tigers. Our guide was very vocal about this as well. He told us to stay on the course as instructed for our safety. The first thing we saw while walking through the lawns toward the jungle track were land monitor lizards strolling around trying to warm their cold-blooded bodies in the heat of the morning sun. They were giving us lazy glances and were surprisingly quick to dash away when we tried getting closer to click picture. Our guide took us up the hill where we met a chameleon daintily sitting on a sleek branch watching us cautiously. Salam took a long branch and drove the chameleon down, caught her and showed us the beautiful pattern on its skin. After a little show and allowing it to perch on our hands we headed towards the ‘drum tree’ as I call it. This huge hollow tree has a smooth surface where were can beat with a rock and the sound reverberates across the forest floor. We accidentally also came across highly venomous species - the coral snake that was supposed to be as deadly as it looked beautiful. We arrived at the final destination a little waterfall hidden inside the forest. The water was cold, sweet and inviting. We enjoyed a quick soak in the water and headed back down. On the way down, Salam regaled us with stories of taking Sushmita Sen (a popular Indian Actress) around the forest and the foolish deeds of tourist who thing they know everything and ended up in the hospital after a brush with the poison Ivy. Next, we hired a car and a driver, a gentleman named Arif. Arif used to be a sailor on a ship carrying oil. During one of his many voyages he met a pretty girl from Tioman, married her and came to the island after the marriage. The magic of the island settled in on him and ever since he’s been telling his wife that he will go back to work the following month. In the meantime time he was cashing in on his worldly experiences and was one the most successful guides taking tourists around in his car. He told us that Tioman island officials tried to capture mouse deer and create a little zoo for tourists to see these little creatures. After the successful installation of these tiny endearing creatures in their pens, the officials came back the next morning to see every empty and realising the all the deer had been eaten by the pythons during the night, and that was the end of the little ‘mouse deer’ project on the island. We first went to Juara water falls. 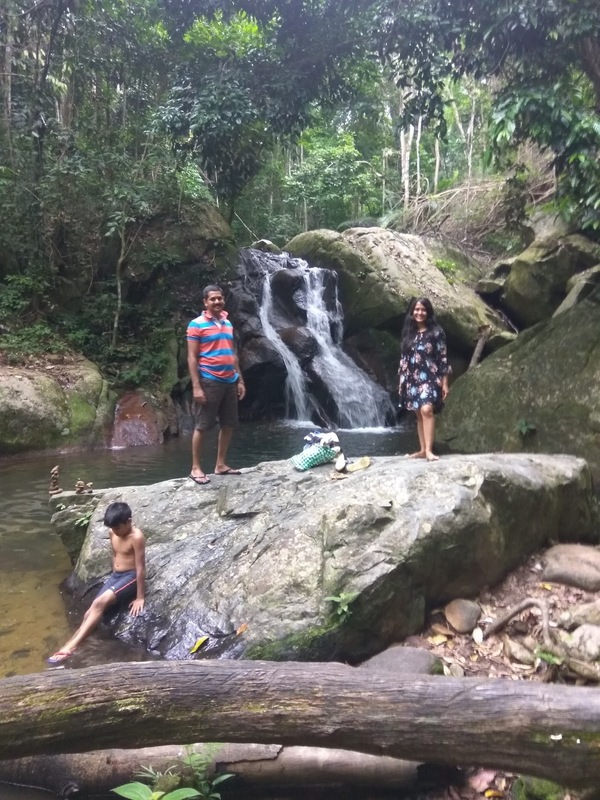 Following Arif’s lead, I jumped into the murky dark water and plunged into the icy cold depths of the little pool collected below the gushing water. Juara waterfall is one of the fresh water sources that makes Tioman Island habitable. After an hour of frolicking, we headed to the beach. Juara beach is one of the popular destinations on the island. It is also close to the Turtle Project run by the island. After an exciting day, we finally came back to our hotel and decided to explore the little shack behind the resort for food. The food was amazing, the crowd was vibrant and we could get a fulfilling meal for 11 Ringgits. So, this was to be our regular haunt for the next two days that we stayed at Tioman Island. The next leg of our adventure was exploring all the activities organised on the island. Speedboat rides, snorkeling and scuba diving. For scuba diving the agents at my resorts told us that we need to enroll for at least 3 days during which they will give us basic training and then take us into the ocean so we had to pass on that. We however, hired a private speed boat that cost us between 150 to 200 Ringgits. 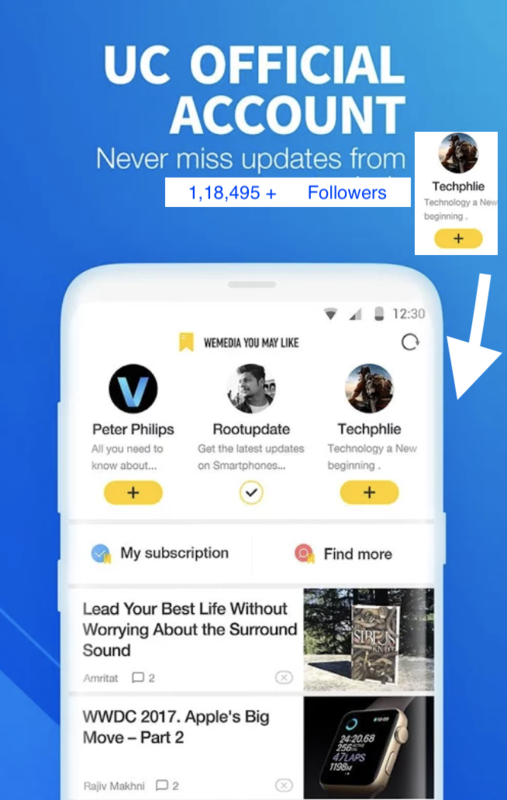 Out guide – beach boy! said he would take us to 4 points and allow us to snorkel there. We started with the Coral Island, a perfect spot for beginners to throw caution aside and experience the joys or snorkeling in the crystal clear South China seas. But this place was soon crowded with people and we quickly motored away to a secluded cove on the other side of the island. Snorkeling here was like entering another world. The splash of colours, the ocean floor teaming with life, corals, the little creatures peeping out of their homes (the coral) it was all too much to take in at once. But after a little while I could make sense of this myriad of activities and focus on one thing at a time. The most common fishes underwater were the parrot fish, blue spotted sting ray, bat fish, angel fish, remora, wrasse, trevallies, puffer fish and a many more fishes I couldn’t identify, but all just as colourful and beautiful. With every wave the sea cucumbers rolled to and fro like they had no care in the world. The most exciting part was to be able to see pairs of clown fish peeking out of the Sea anemone that they had adopted as their home. After 30 minutes of floating over the corals the fishes began to get familiar with me and decided that if I wasn’t moving out of their territory they’d at least make the most of my presence by biting me. At one point, I’d whack away a parrot fish and he would position himself in such a way and bite me so that my hands wouldn’t reach him. After 15 minutes of being bitten I decided I’d had enough. Beach Boy started throwing pieces of bread which brought in some bigger fish from the sea bed and it was an incredible experience to literally have my nose rubbing against the nose of a strange inquisitive fish wondering what kind of a creature I was. with a hunch back. Our guide dropped us, at the Asah beach. We climbed up the stairs and finally reached the lonely Asah falls. Another dip in the sweet tasting water, before concluding our excursion. 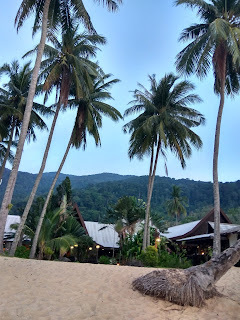 Three days on Pulau Tioman was like living in paradise. But like everything else the island is facing the threat of pollution and population as it’s popularity grows. The locals incinerate the waste produced by them, but as I went around I saw heaps of bike and car tyres randomly strewn around as rubber cannot be burnt easily. There were signs of waste paper and plastic being throw close to forests. If the government were to intervene early and impose a fine system for anyone who litters that place and lay a strong process to remove waste from the island efficiently, Tioman might remain like a slice of paradise on earth for many years to come. I missed out a lot in this trip, scuba diving, the mouse deer, Raffelasia Flower and a few little activities that I would have caught up on only if I had some more time. But this destination is definitely worth visiting again and I plan to do that very soon! .